Baro De Viver, 58, 08310 argentona, Spain. 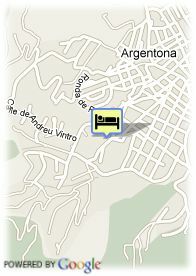 Hotel Vila D Argentona is a modern and functional hotel which is perfect to rest and enjoy the environment. It is a 3 stars hotel located in the Maresme area, next to Barcelona but in a quiet and tranquil area. Just a few minutes away from the beach and mountain. The hotel has a top quality staff.